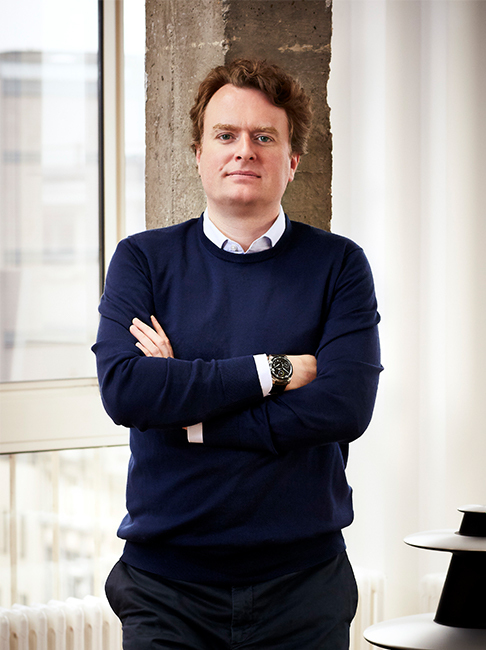 Winners of the Horological Revelation Award at the prestigious Grand Prix d’Horlogerie, Ressence takes a distinctive approach to the craft of contemporary Fine Watchmaking, combining Swiss-made calibres with unmatched self-engineered innovation to reimagining how mechanical watches can function and interact with its user in the modern age. The brand’s mission statement is captured in its name: Ressence, short for the Renaissance of the Essential. It was in 2010, on the Zero Series watches, that Ressence first unveiled the patented invention on which its signature expression of Time rests: The Ressence Orbital Convex System (ROCS) is composed of co-planar discs and rings of different sizes which are curved to match the contour of the crystal that covers them. The purpose is a more efficient way of telling time. Information is displayed on a single surface, much like words on a piece of paper, making for improved readability. This differs than that of a traditional watch, where the hands and dial are layered on one another producing an uneven viewing plane. First debuted in 2013, the Type 3 is the first ever oil-filled mechanical watch. A true achievement in Fine Watchmaking, the Type 3 is designed with a “water drop” dial effect in order to achieve crystal clear dial legibility for the wearer. In 2015, Type 5, the first mechanical watch to be perfectly readable underwater was released. The oil ensures complete legibility under water whatever the angle of view. It cancels out what is known as total internal reflection. In 2016, the Fondation de la Haute Horlogerie identified Ressence as one of the 64 brands worldwide that belong within the Fine Watchmaking perimeter. This year, Ressence launches Type 2, the first mechanical watch with a smart crown, the e-Crown®. The Type 1 Squared is the dressier watch among the collection. Less “dematerialised” than the other models, the Type 1 Squared plays subtly with a few classic fine-watchmaking codes for a more assertive wrist presence. While remaining faithful to the signature dial of the brand the watch differs both in its case design and in its material. Born from the intersection of 6 spheres, it has a cushion shape case in polished stainless steel, with a satin finish back. The Type 1 Squared is manually set via a lever on its case back. The watch has no crown, the winding and setting mechanism being the case-back itself, for better ergonomics and allowing a left-right fit. When setting the time, the rotation of the lever corresponds exactly to the movement of the discs on the dial in a ratio of 1 to 1. An up-to-date reminder of the key once used to wind clocks, watches and mechanical toys. The Type 5 is the first mechanical watch to be perfectly readable underwater regardless of the viewing angle. The use of oil inside the upper part of the watch cancels out what is known as Total Internal Reflection. Typically, when under the water, a traditional diver’s watch needs to be viewed straight on in order to be read properly – otherwise refraction turns the glass into a mirror. But not with the oil-filled Type 5: this gives it complete legibility whatever the angle of view. The organic design of the Type 5 takes its inspiration from nature, specifically sea turtles. Their distinct aqua-dynamic shape means they are best able to propel themselves easily through the water – so what better shape too for an amphibious watch, right down to its seamlessly integrated uni-directional bezel? The watch is made from titanium ensuring that it is also lightweight – just 87g – and extremely comfortable to wear. The watch is graphically very strong -for improved readability -and is the ideal watch for the gentleman diver, whether he’s in the water or around town. The Type 3 is the first ever oil-filled mechanical watch. A true achievement in Fine Watchmaking, the Type 3 is designed with a “water drop” dial effect in order to achieve crystal clear dial legibility for the wearer. Because oil and glass share very similar responses to light refraction, the eye is tricked into momentarily losing its depth perception. The result is that the watch’s dial seems ever closer, vision of it apparently unimpeded by glass at all. The creation of the Type 3 was not without its challenges. One such example was the escapement ability to oscillate properly in a viscous fluid. 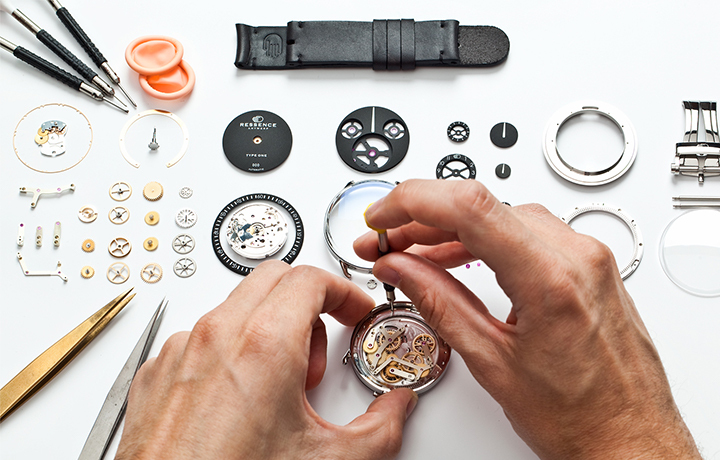 Ressence ingeniously designed a two-chamber system inside the Type 3 to keep the mechanical movement and oil separate. As such with the two-chamber system, there is no direct mechanical link between the watch’s movement and the ROCS. To accommodate this, the Type 3 uses a magnetic transmission to tie the modules together. In order to compensate for oil volume fluctuation (dependent on temperature), the watch is also fitted with a system of seven small bellows that expand and contract dependent on the increase and decrease of the oil’s volume. The Type 2 main feature is the smart e-Crown®. e-Crown® automatically sets and adjusts the Type 2 to the right time when needed. Driven by user experience, it combines the reliability of electronics with the emotion and beauty of mechanical engineering. e-Crown® is activated and controlled by tapping the crystal on the dial of the Type 2, offering a new tactile experience and user-friendliness to mechanical watches. Visually, it is represented on the dial by the selector sub disc and its four modes (time zone 1, time zone 2, app and e-Crown off). The Type 2 uses light energy to power the e-Crown®. Photovoltaic cells (some hidden behind 10 micro-shutters on the dial) will use outside light as an energy source making the watch self-sufficient. The Type 2 is manually set via the lever on its case back. By double tapping the crystal, the manually set time is digitally registered by e-Crown®. There is no need to think about checking and adjusting the watch anymore, e-Crown® does it automatically. Even after three months of inactivity, once the watch is fastened to the wrist and the wearer taps the crystal, e-Crown® will automatically set it to the right time. 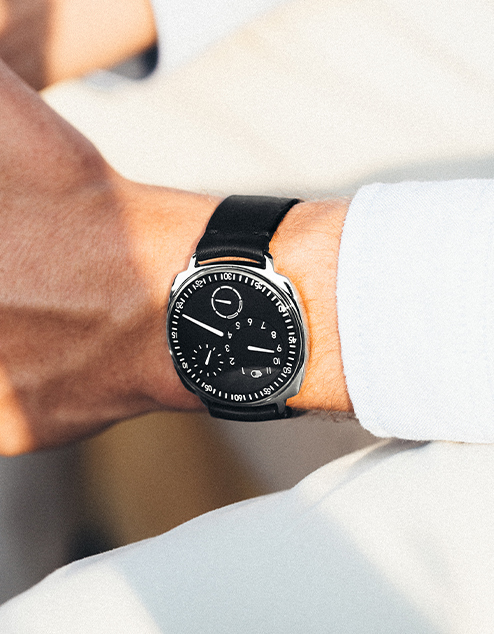 The Type 1 Slim is Ressence’s most stripped back watch to date. It differs distinctly from the rest of the collection in its visual balance of simplicity and complexity, one that ensures its aesthetic only continues to enrich over the years. The new organic and sharp at once case has been designed around the wrist. Not only it is slimmer (11mm thick) – compared to the previous generation – but also resolutely more modern with its seemingly integrated strap. Lugs and case are in fact milled in one action from the same grade 5 titanium block. The Type 1 Slim is manually set via a lever on its case back. The watch has no crown, the winding and setting mechanism being the case-back itself, for better ergonomics and allowing a left-right fit. It is all tactile curves, the domed sapphire glass extending to the very edge of the case – making the watch more sapphire than metal for greater readability.